U-CyTech offers CPE-based Anti-Viral Assay (AVA) testing, also known as cytopathic effect (CPE) inhibition assay, for interferons. In this in vitro bioassay, one unit is defined as the quantity of interferon that reduces the CPE of viral infection by 50%. The antiviral bioactivities of test samples are compared to an International or Laboratory standard preparation and expressed in International Units (IU) or Laboratory Units (LU)/ml. The bioactivity of human, rat and mouse interferon is measured using human lung epithelial cells (HEp-2), rat embryonic cells (RATEC) and mouse fibroblast cells (L929) respectively, challenged with Vesicular stomatitis virus (VSV). Summarizing report describing the quantitative determination of the bioactivity of interferons by measuring the interferon-induced inhibition of the viral cytopathic effect of Vesicular stomatitis virus on indicator cells. HEp-2, L-929 and Ratec cells are responsive to the antiviral activity of interferons and yield a uniform cytopatic effect to Vesicular stomatitis virus by inhibition of cellular uptake of a colored dye (naphthol blue-black or crystal violet). The uptake of the dye is a linear function relative to cell concentration up to the maximum number of cells in a single microtiter well. Between 2.0 x 104 and 5.0 x 104 cells/well (depending on indicator cells) the function is linear with a correlation coefficient of > 0.950. For obtaining distinct CPE, VSV (Indiana strain) is used for the human, mouse and rat interferon antiviral bioassays. The virus is propagated on Ratec cells, a rat embryonic cell line. Virus preparations are stored at -80 °C in small aliquots containing approximately 4.0 x 107 plaque forming units (PFU) per ml. 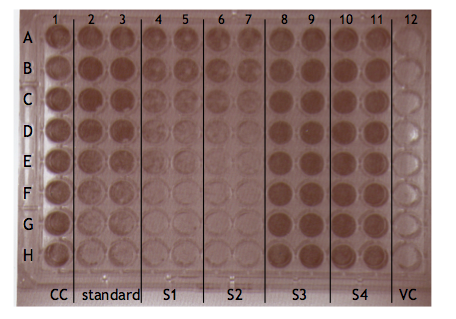 For each cell line different concentrations of viral particles are used to obtain distinct CPE values after 24h incubation at 37 °C. International reference standards are obtained from the National Institute for Biological Standards and Control (NIBSC) in the UK and interferons for the preparation of laboratory standards are obtained from a reputable commercial source. The laboratory standards are calibrated to International NIBSC reference standards and expressed in LU (laboratory unit)/ml in which 1.0 LU is equal to 1.0 International unit (IU). The vials with laboratory standards are stored at -80 °C in small aliquots for single use. An example of results in a CPE-based AVA testing. VC: virus control with >90% CPE. In this study the specific anti-viral activity of rat IFN-β was determined by U-CyTech using the CPE bioassay that measures the ability of the protein to protect rat RATEC cells from cytotoxicity due to infection with VSV.